Uses: use on fabric, body, face, hair, hands, airbrush, or fill liquor bottles for the show, basically anything you can think of. PLEASE note that if you choose to use with an airbrush or any other way of application we are not responsible if it does not work with your product since there are so many ways to apply it is difficult to know what you have and if it will work with it. Due to that please buy small qty to test the product before purchasing as we don’t accept returns. UV Reactive Neon Liquid Body Paint. This is awesome for those evening that you want to dress up and really stand out in the crowd. Or use at Halloween parties. 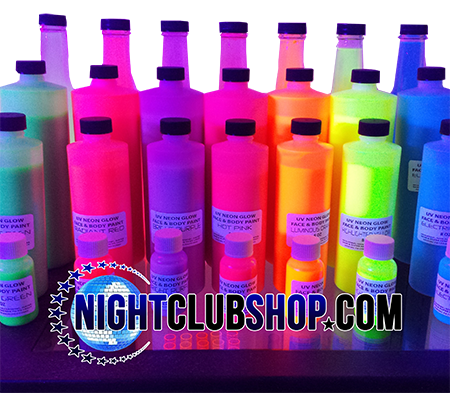 These are nontoxic, non-allergenic, water based & super reactive under black light. Choose your Color and if you are interested in larger bottles we have 8 Ounces and 16 Ounce bottles available to purchase at our eBay store under Glow Products. These are UV reactive paints NOT glow in the dark paint although as long as you have a UV light source these are very bright under those conditions. Warning: These are for visual effects only not to be worn on a daily basis. Remove with warm water and soap. Comes off easily.